In this follow-up to his bestselling Rich Dad Poor Dad, Kiyosaki offers little substance and much fluff, forcing readers to wade through business cliches and unattributed statistics in order to find the few rough nuggets of entrepreneurial wisdom that make this book worth the asking price. Fear, Kiyosaki writes, is what separates employees from entrepreneurs. The latter are employees who have faced down their fears about job security and drawing their next paycheck and are willing to fail in order to be free. Kiyosaki's other maxims are decidedly less striking. Lesson 8, ""What Is the Job of the Business Leader? "", depends upon a triangular ""team-leadership-mission"" diagram that is an amalgam of current business book gimmickry. The same is true of Lesson 6, ""The Three Kinds of Money""-spiritual, competitive, cooperative-which offers nothing that hasn't appeared in other business titles. He states in Chapter 1 that statistics show 90 percent of all new businesses fail within five years, a questionable figure that appears to contradict U.S. Census and Small Business Administration statistics. 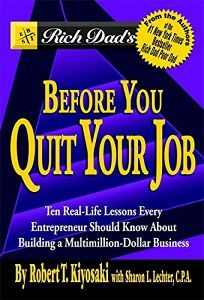 (Kiyosaki also neglects to mention that many small businesses that close are successful at closure.) Largely due to Kiyosaki's bombastic style, this is an inspiring read, but it bears about as much resemblance to actual entrepreneurship as steamy romance novels do to actual relationships.